Just blocks from the Fremont Street Experience, the El Cortez is Las Vegas’ longest continuously running hotel/casino and it is the only Las Vegas hotel still standing to be listed on the National Register of Historic Places. 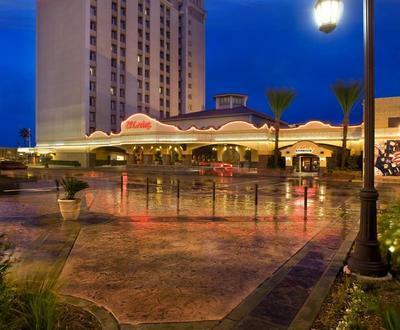 One of its main features is the gaming, and being on the casino floor is truly a pleasant experience. The hotel boasts more than 1,000 slot machines (including many that are coin-operated — for a blast to the past); popular table games like blackjack, roulette, craps and baccarat; and an active sports book. It’s all waiting for fortune seekers to discover! Low-ante tables bustle with budding gamblers who want to ease into things slowly. When it comes to dining, there’s Siegel’s 1941. Open 24 hours, it’s an upscale yet casual restaurant where you can dig into everything from roast prime rib, chicken Milanese, steak frites and corned beef hash to Belgian waffles and omelets. For quick bites head to Subway and Pizza lotto. Players can even take advantage of the casino’s Gambling Gourmet service, which provides them with game-side meals served from a rolling cart. Live piano music can also be enjoyed in The Parlour Bar & Lounge, an elegant venue that boasts a menu packed with modern and vintage cocktails. While the hotel has graced downtown since 1941 and still showcases its Spanish Colonial Revival style architecture on the exterior, more than $25 million has been spent in recent years on major improvements and renovations to all aspects of the property, right down to the wiring and electrical components in the elevators. All the rooms have been upgraded, and the property’s old Ogden House, located across the street, has been converted into the modern El Cortez Cabana Suites, a South Beach-style boutique hotel with 64 rooms and its own fitness center.